We are all supposed to have our individual freedoms right?To do what we want and how we want, as long as it does not hurt any other person. That’s what our basic human rights are based on. But the above position isn’t true, if not, being homosexual will not be an offence in Nigeria and we will be able to kill ourselves. That’s right, suicide is a crime. I wonder why though, it’s not like I am killing someone else. Is guilty of a felony and is liable to imprisonment for life. 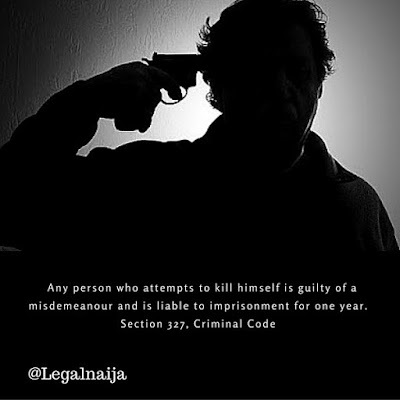 Also Section 327, states that any person who attempts to kill himself is guilty of a misdemeanour and is liable to imprisonment for one year. Obviously, the law seeks to prevent people from committing suicide based on moral grounds, however, one question that bothers me is, assuming someone wants to kill himself, why will locking the person in a jail cell be a deterrent, he or she may as well try again while in his prison cell. I believe the law should have made some provision for rehabilitating such a person and giving the person another positive outlook to life. Anyway, that’s jurisprudence for another day, for now, my suggestion to you is, if you plan to commit suicide, ensure its successful or else you may be going to jail. What do you think about this discriminatory law?